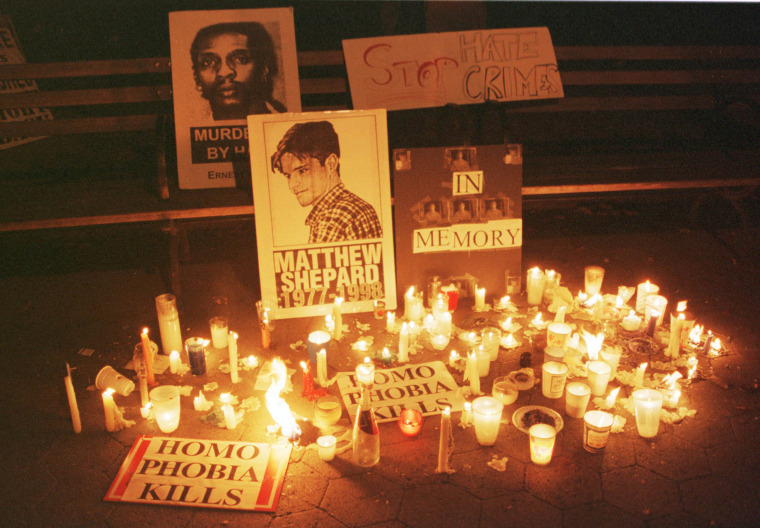 Shepard, the victim of a deadly 1998 attack in Wyoming, spawned a national conversation about homophobia and violence. The remains of Matthew Shepard, the 21-year-old Wyoming man who was savagely beaten and murdered in a homophobic attack in 1998, will be interred at Washington National Cathedral. “We’ve given much thought to Matt’s final resting place, and we found the Washington National Cathedral is an ideal choice, as Matt loved the Episcopal Church and felt welcomed by his church in Wyoming,” Judy Shepard, Matthew’s mother, said in the statement shared with NBC News. The interment will take place on Oct. 26, and the service will be presided over by the Right Rev. Mariann Edgar Budde, Episcopal bishop of Washington, and the Right Rev. V. Gene Robinson, whose appointment in 2003 as the first openly gay bishop in the Anglican Communion sparked a global schism between European, American and African churches. Shepard’s ashes will be interred at the Northwest Washington cathedral two weeks after the 20th anniversary of his death, Oct. 12. The attack on Shepard took place on Oct. 6, 1998, when he was beaten and tied to a fence near Laramie, Wyoming. The attack captured international headlines and focused attention on violence driven by anti-gay animus. Many states and municipalities expanded or passed hate crimes laws in response. In 2009, President Barack Obama signed a bill bearing Shepard's name that expanded the 1968 Civil Rights Act to include hate crimes committed because of a person’s sexuality, disability or gender identity, in addition to a person’s race, color, religion or national origin. Just months after their son’s death, Judy and Dennis Shepard founded the Matthew Shepard Foundation, which aims to “erase hate by replacing it with understanding, compassion and acceptance.” The Shepards have been staunch advocates for the LGBTQ community for the past 20 years.